Here's a convenient lunch idea, composed of leftovers from the previous post on pickled chard stems. Into a pint jar I packed farro, chopped carrots, pickled chard stems and almonds, and drizzled over some olive oil (the pickles brought along some vinegar to meld into a vinaigrette during the day). On top I gently layered some greens so that when I inverted the contents into a bowl at lunch, I had a lovely composed salad. 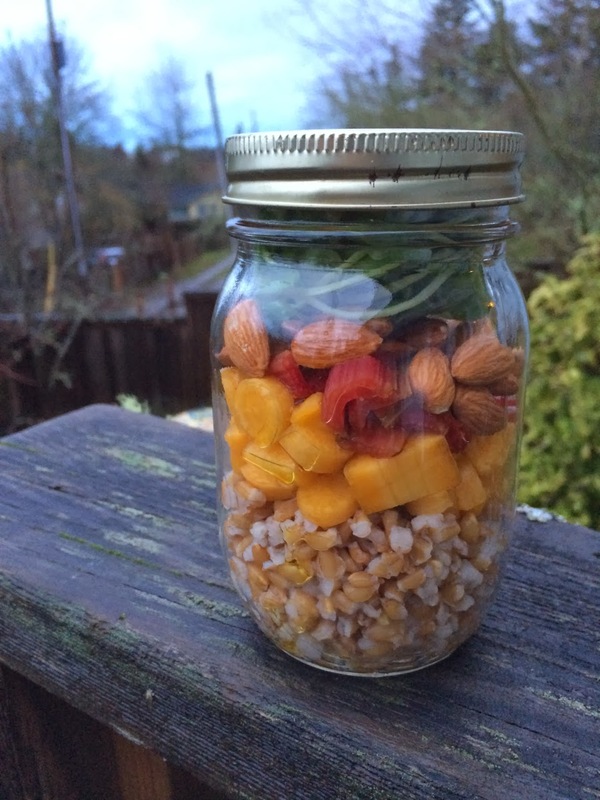 In a pint mason jar layer grains, vegetables, pickles, and protein, and drizzle over olive oil. Layer on greens and close the jar. To serve, invert the jar into a bowl.